08:45 Hello everyone and welcome to AUTOSPORT Live for full coverage of the final round in the 2010 FIA Formula 1 world championship. So it all comes down to this. An unprecedented four drivers from three teams will battle it out over the next three days of competition to determine this season's world champion driver. It will be a fitting end to what has been a close and exciting campaign. Red Bull Racing arrives in Abu Dhabi as the champion constructor and will be looking to add the driver's title to secure a spectacular double, but Ferrari and McLaren will push the ultrafast RB6s to the limit. 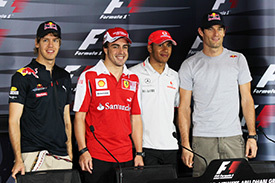 Fernando Alonso and Lewis Hamilton must go for the win this weekend and see what happens with the Red Bull drivers. Sunday's ultimate battle around the Yas Marina circuit will be where the crown is won and lost, while qualifying on Saturday will sort out who has the fastest one lap pace. But, it's the three practice sessions that will give us the first indication of relative car performance and race pace. Any slip-up or loss of track time could be critical for any of the top four drivers, so settle back and enjoy the action with a us as the battle for the world championship is played out before our eyes. 08:46 Today, we will guide you through the opening practice sessions with minute-by-minute commentary as the teams and drivers begin their build-up to the race. Later, at 12:45 GMT, we will return for full coverage of the second practice session. AUTOSPORT Live will end the day with a detailed analysis of the impending rain and how it will shape the rest of the event, on the Abu Dhabi Grand Prix Weather page. 08:47 Fernando Alonso left Interlagos on Sunday with a useful eight-point advantage in the drivers' championship from Mark Webber, but Sebastian Vettel's victory in Brazil puts him right back in the frame, while Lewis Hamilton also has a remote chance at the championship but needs an awful lot to happen for the title to be heading his way. The constructors' championship is settled in favour of Red Bull, and there is unlikely to be a switch between McLaren and Ferrari for the runner-up spot. Mercedes GP and Renault are cemented in a lonely fourth and fifth, but a battle royal has been raging throughout the second half of the season for sixth, with Williams overhauling Force India last weekend at Interlagos thanks to the efforts of Nico Hulkenberg. 08:49 The second shower in the space of four days fell just one hour ago to widespread surprise in the paddock ahead of the start of practice. Heavy rain fell for a short time before the scattered shower moved out of the area, with the track now quickly drying. Conditions are expected to quickly return to the typical sunshine expected here. Temperatures are forecast to reach 31 Celsius later in the day as sunshine burns through the clouds. 08:51 Motor racing fans love to debate the action on track and the live forum is your opportunity to share your experiences of the Formula 1 weekend with everyone. • Who do you feel deserves to win the driver's championship? • Will any of the title contenders slip up today resulting in a loss of track time? • Can Button and Massa get among the frontrunners to add another element to the battle? 08:53 Keep up to speed with our minute-by-minute commentary on the move with the AUTOSPORT app. 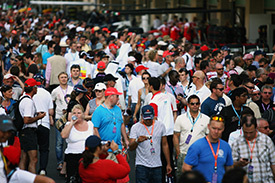 08:55 First practice for the Abu Dhabi Grand Prix gets underway in five minutes. 08:56 The track is drying extremely rapidly after that earlier shower with the 28 degree ambient quickly warming the track surface. 08:58 Sebastian Vettel is ready for action in his Red Bull machine ahead of a high-pressure weekend for the young German. 08:59 Championship leader Fernando Alonso is also ready to head out for his first lap of the weekend. 0 min: Christian Klien leads the cars out of the pits in his HRT. 0 min: Di Grassi, Alguersuari and Buemi join the early installation laps. 2 min: Fairuz Fauzy is driving Heikki Kovalainen's Lotus for this session while Jerome d'Ambrosio isn't replacing di Grassi this time. 3 min: Installation laps continue with Kubica and Alonso among the drivers currently touring around the damp circuit. 4 min: Alonso has intermediates on his Ferrari as he wraps up his installation lap and heads to the pits. 5 min: Kobayashi and Liuzzi have continued into second laps. 6 min: Fairuz Fauzy has spun his Lotus on the installation lap. 7 min: Christian Klien is watching progress in the HRT garage as he waits for track conditions to improve. 8 min: Fauzy has recovered from his major moment and is now back in the Lotus garage. 8 min: Nico Rosberg takes off his balaclava as he gets ready for a long wait before heading out for meaningful running. 9 min: Adrian Sutil is back out on the rapidly drying circuit for another look at track conditions in the Force India. 9 min: Turn 11, just before the start of the twisting marina, is the dampest at the moment with the track shaded by the grandstand on the outside. 9 min: The German is taking things very gingerly and heads back into the pits. 11 min: Sebastian Vettel comes back out to continue with some aerodynamic work for Red Bull, while his team-mate Mark Webber remains in the cockpit of the other RB6. 12 min: A lengthy pause is likely for the leading runners now as they sit out the final drying of the surface and wait for rubber to go down. 12 min: Vettel is out there using a set of intermediate tyres. 12 min: Glock and Kubica are back out on track. 13 min: Vettel returns to the pits after a slow lap of the Yas Marina circuit. 14 min: Fauzy has stepped out of his Lotus and is chatting with engineers about his installation lap spin. 15 min: Timo Glock has been testing conditions on slicks and finds things still slippery on the damp patch where the track passes under the hotel. 15 min: Mark Webber joins the racetrack also with a set of intermediates bolted onto the car. 16 min: Sebastien Buemi looks relaxed on the pitwall as he waits for track conditions to improve as Webber continues round on his checking lap. 17 min: Webber steers the Red Bull Renault into the pits, leaving the track empty once again. 20 min: Red Bull has is testing with a revised rear wing. Both Vettel and Webber have been out with flow-vis paint on the rear of the car to gather yet more data for the team. 20 min: The track is up to 31 Celsius with the only significant dampness remaining under the trendy bar of the Yas Hotel that spans the circuit. 21 min: Petrov is the only man on track at the moment as the Russian tests the conditions in his Renault. 22 min: While glorious sunshine continues around the circuit, the official Formula 1 radar is picking up the movement of the shower that doused the track 90 minutes ago. 22 min: At Force India, extensive work is nearing completion on Tonio Liuzzi's brakes. 24 min: Piero Ferrari is on hand for a crucial weekend for the team and is chatting with a relaxed Felipe Massa in the garage. 26 min: Michael Schumacher is on the circuit ... and quickly back into the pits. He was out on intermediates. 26 min: Hamilton is now out for his second lap of the day for some aerodynamic testing. 28 min: Hamilton heads back to the McLaren garage, leaving the track silent for now. 28 min: At Red Bull, Dr. Helmut Marko is in deep conversation with his charge Sebastian Vettel with the German showing no immediate sign of heading out. 29 min: Bruno Senna is back in the cockpit of the HRT and looks like he may go out in the next few minutes. 30 min: The only noise at the circuit for the moment is a plane passing overhead to land at the nearby airport. 32 min: Kobayashi is not looking like he is going out any time soon as he chats with Peter Sauber and Monisha Kaltenborn. 32 min: 32 minutes of the first session at Yas Marina have passed without any times being set. That should change fairly soon. 34 min: Robert Kubica shares a joke with Renault team principal Eric Boullier on the pitwall. 35 min: Tonio Liuzzi wanders back across from the pitwall towards the garage as he slowly gets ready for a first run of laps. 36 min: Nico Rosberg breaks the silence and heads out onto the circuit on intermediates. 36 min: The track is almost completely dry as Rosberg continues round. 38 min: Rosberg crosses the line and will go on for another lap ... and he's wide at Turn 1. He continues via the asphalt run-off area. 39 min: Button and Hamilton add a further gentle installation lap to their count. 39 min: Rosberg guides the Mercedes back into the pits at the end of a double-lap checking run to gather more data. 41 min: Rosberg remains behind the wheel which is hopefully a sign that he will be back on track soon, because there has been precious little in the way of action so far. 44 min: Many casual fans looking in on Formula 1 on the back of the championship story would be forgiven for thinking the drivers are on strike. 44 min: Dry running is paramount given the forecast for the weekend and the teams will put in some laps once they are satisfied that track conditions are good enough to gather worthwhile data. 44 min: The racing line has a peculiar appearance around much of the lap, with the rain followed by early lapping cars bringing up a chemical used to clean the surface. 45 min: Button heads through the unique pit exit tunnel and takes his McLaren back out for another lap. 46 min: Jaime Alguersuari confirms on the Toro Rosso team radio that he would prefer to wait until he sees some quick laps by other drivers in the current track conditions before going out himself. 46 min: There is also a small amount of dampness remaining under the access bridge over back straight. 47 min: Petrov is out on a lap with slick tyres on his Renault. He is taking it easy on his outlap before getting a lap against the clock underway. 49 min: Petrov guides his Renault around a careful first tour to clock the first time at a 1m51.465s. 49 min: Hulkenberg is the next man to post a lap time and he is quicker than Petrov with 1m51.207s. 50 min: The fastest time here last year was a 1m39.695s set in Q2 by Lewis Hamilton. 51 min: Hulkenberg is much quicker on his second timed lap as once again he shows the benefit of keeping tyre temperature high by immediately nailing a hard lap out of the pits. 51 min: Petrov improves by a fraction with a 1m50.370s but sets the fastest first sector on his latest tour. 52 min: Hulkenberg duly improves with a lap of 1m48.863s to extend the advantage over Petrov to almost three seconds. 52 min: Buemi is the third driver to post a time on the board. He slots into third position with 1m51.513s. 52 min: Petrov sets a 1m47.794s to take over the early benchmark. 53 min: Mark Webber and Tonio Liuzzi are now on the circuit for a first serious run of laps. 53 min: Massa and Alonso are now out for first runs in the Ferraris. 53 min: Liuzzi goes fourth out of four with a time of 1m51.703s in the Force India as he checks over the brake repairs. 54 min: Massa joins the order in third quickest with a lap of 1m48.866s. 54 min: Hulkenberg remains in second behind Petrov after an improvement of 1m47.828s. 55 min: Petrov continues his run on the ever-improving circuit with a 1m46.861s now the time to beat. 55 min: Alguersuari joins his Toro Rosso team-mate Buemi on the board in sixth with a lap of 1m49.855s. 55 min: Massa is told to pit his Ferrari because of a "small telemetry problem"
55 min: Webber completes his first timed lap of the day in 1m49.320s to slot into sixth for the moment. 56 min: Massa has, however, continued and clocks a 1m47.280s to go second quickest to Petrov. 56 min: Webber shows that there is little grip available on the circuit as he continues on a second timed lap. 56 min: Renault's Russian continues to set the early pace with his latest lap a 1m46.028s. 57 min: Webber crosses the line in 1m46.626s to go second behind Petrov. 57 min: Alonso puts in his first proper lap of the day to go second quickest with a 1m46.419s. 58 min: Liuzzi is now sixth after a lap of 1m47.529s, putting him just ahead of the Toro Rosso duo. 59 min: Mark Webber is on for an improvement, but he loses some time in the final sector and remains in third. 59 min: Alonso goes one better with his next lap to top the times in 1m45.807s. 60 min: Robert Kubica springs up to third quickest with a lap of 1m46.180s. 60 min: Vettel is finally out on the circuit for his first run of the day as his team-mate Webber continues on another improving lap. 60 min: The Australian moves up two places to top the list with 1m45.177s. 61 min: Vettel is coming towards the end of his first timed lap ... and goes fifth with 1m46.363s. 63 min: Vettel moves to the front with a lap of 1m44.274s as Red Bull tops the list once again. 64 min: Webber is about to respond in kind and we could be set for another little cameo between these two. 64 min: Webber posts 1m43.840s to retake the top spot. Vettel is second with Kubica third, Alonso fourth and Heidfeld fifth. 65 min: Kubica temporarily split the Red Bull pair but is now third, a second off the leading pace. 65 min: Alguersuari move up to sixth place with 1m46.003s at the completion of his ninth lap of the day. 66 min: Adrian Sutil pops in a 1m45.552s lap to go fourth momentarily. 66 min: Button moves up to fourth quickest with a lap of 1m45.056s in his McLaren. 66 min: Schumacher takes over the fourth position with 1m45.029s as he continues learning the Yas Marina circuit. 67 min: Rosberg is the next man to jump into the top five with a lap of 1m44.718s to go third behind the Red Bull duo. 68 min: Webber returns to the pits and brings his first run of the day to an end. He is currently 0.178s ahead of team-mate Vettel. 68 min: Hamilton is finally out for his first proper run of the day. 69 min: Vettel also returns to the box and the Red Bull engineers will study the data from each driver's first run. 69 min: Button sets the fastest middle sector - featuring the two long straights - as he moves up to third quickest. 70 min: Nico Rosberg is fifth and was set to improve until he caught traffic in the form of Fairuz Fauzy in the final sector. 72 min: Alonso is back on track for a second run. 72 min: Schumacher improves with a lap of 1m44.666s and leapfrogs his team-mate Rosberg to take over fifth place. 72 min: Hamilton sets his first time with a slow 1m53.222s but he is now pushing on with a second lap on fresh tyres. 73 min: Hamilton backs off after setting the fastest first sector time. 73 min: Alonso clocks the fastest time through the twisting final sector as he moves up to fifth quickest. 73 min: Vettel leaves the Red Bull garage and begins his second run. 74 min: Nico Hulkenberg is also out to begin his second run of the day in the Williams. 75 min: Vettel crosses the line and begins a timed lap. 76 min: Hamilton takes advantage of his fresh tyres on the ever-improving surface to split the Red Bulls and take second fastest in 1m43.862s. 76 min: Sutil leaves the Force India garage and starts his second run. Webber follows him out a few seconds later. 77 min: Vettel jumps his team-mate and heads the list with 1m43.477s. 78 min: The Red Bull duo continue up top with Hamilton third, Button fourth, Kubica fifth, Alonso sixth and Kobayashi in seventh. 79 min: Hamilton is told by the McLaren team that he needs to find a whopping half-a-second through the twisting final sector. 80 min: Hamilton responds to that instruction with his best lap of 1m43.772s to again split the Red Bull pair. 81 min: Vettel is on another hot lap but he loses out in traffic in the form of Button in the final sector, so ultimately there is no improvement. 82 min: A 1m43.369s lap for Hamilton moves him to within two tenths of Vettel despite running very wide over the kerbs through the final corners. 82 min: Schumacher and Rosberg continue in eighth and ninth for Mercedes with Nick Heidfeld in 10th, Massa 11th and Petrov in 12th. 83 min: Schumacher moves up one spot to seventh with 1m44.199s. He is 1.022s down on Vettel's leading time so far. 84 min: Hamilton pits after a strong first run. The championship outsider was very quick here last year, taking pole and leading until forced out with a brake problem. 84 min: Liuzzi improves and now runs in 16th place after a lap of 1m46.262s. He is seven-tenths down on team-mate Sutil currently. 86 min: Liuzzi improves slightly with 1m46.118s to go 15th but the lap would have been better, had Senna spotted the Force India in the final corner a little quicker. 87 min: Button is up to third in his McLaren but is again complaining of locking front brakes. 88 min: With the HRT out of the way, Liuzzi tries again and this time he finds a good improvement to go 14th with a lap of 1m45.585s. 88 min: All 24 cars are now on track with just under 90 seconds of the session remaining. 89 min: Rubens Barrichello is another driver who is finding time on a crowded track. He moves up to 13th with 1m45.474s. 90 min: The flag is out to end first practice at Yas Marina. 10:31 Nico Hulkenberg does manage to improve on his final timed lap of the session. He goes 17th with 1m46.644s. 10:31 The drivers will be allowed to make a practice start from the grid as there is no opportunity to test a launch at the unique pit exit. 10:32 Sebastian Vettel leads the pack at the end of first practice at Abu Dhabi with a lap time of 1m42.760s. 10:32 Lewis Hamilton and Jenson Button follow up in second and third for McLaren with Mark Webber in fourth. 10:33 Robert Kubica ends the session 1.320s down on the benchmark in fifth with championship leader Alonso sixth and Schumacher in seventh. 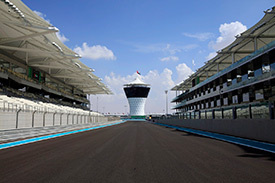 10:33 Kamui Kobayashi was eighth with Rosberg ninth and Heidfeld making it a good start to the weekend for Sauber in 10th. 10:35 Rubens Barrichello has pulled to the side of the racetrack with no power two-thirds of the way down the long back-straight. 10:35 Barrichello climbs out of the stranded Williams and will stay on hand to oversee the car's recovery to the pits. 10:36 The Williams ground to a halt shortly before Turn 10. He set the 13th quickest time in the session with 1m45.474s. 10:39 A painfully slow start to the final event of the season, but gradually the drivers came out to put laps on the board. Red Bull and McLaren have started positively but we will have to wait a little longer to see what the prancing horse has in reserve. The track should improve as we go into the evening and the intensity will rise as the drivers begin to push a little harder as more rubber is laid down. Join us for second practice from the Yas Marina circuit at 12:45 GMT.